The Foothill Force Jump Rope Team is a nationally known group of boys and girls from throughout the San Gabriel Valley. The team is associated with the United States Amateur Jump Rope (USAJR) and the American Jump Rope Federation (AMJRF). 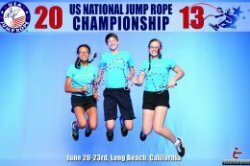 Team members have competed in national tournaments like the AAU Junior Olympic Games, the USAJR Nationals, the World Jump Rope Championships, as well as in regional competitions. Our jumpers are available to entertain at birthday parties, celebrations, rallies, and other events. Many of our jumpers are talented instructors and can teach jump rope skills to groups large or small. Some of our jumpers have been in music videos, TV commercials, and TV shows. Foothill Force strives to promote the sport of jump rope in many ways. They have performed at community events such as Skirball Cultural Center's Hanukkah Family Festival, Los Angeles' Grand Park July 4th Block Party, Duarte's Concert in the Park, County of San Bernardino Department of Public Health Nutrition Program, the Girl Scout Cookie Kickoff, and La Canada's Memorial Day Parade. They perform for charitable purposes such as Jump-4-Darfur, Children's Hospital Los Angeles, Oak Park Convalescent Home, Breast Cancer Awareness, and more. The team also host jump rope classes and workshops at various times throughout the year. The Foothill Force are proud to promote health and fitness through the growing sport of jump rope. Coach Nigel Angold worked for the European Space Agency for 20 years doing Satellite Operations. He joined Foothill Force as coach in 2008, after having coached and refereed youth soccer for seven years. He has attended AAU Junior Olympic Games in 2005, USAJR Nationals from 2007-2013, and several World Jump Rope Championships. He has attended jump rope camps and workshops in Texas, Colorado, and North Carolina. Coach Kathy Weninger worked as a Software Engineer for fifteen years before retiring to raise a family. She joined Foothill Force as coach in 2008. She attended the AAU Junior Olympic Games from 2005-2009, and USAJR Nationals every year from 2007-2013. She has competed at USAJR Nationals and until 2017 was the reigning National Record holder in 30 second speed for females aged 50+. She has attended a variety of jump rope coach’s trainings at camps in Texas, North Carolina, Florida, Ohio, and Washington. She taught Elementary School summer jump rope classes for South Pasadena School District in 2011 and for La Canada Unified School District every summer since 2011. She has provided jump rope and double dutch expertise for television shows such as The Amazing Race, The Big Bang Theory, and Forever Young. Kathy loves to teach private or semi-private jump rope lessons. Coach Mike Fry has jumped for the Heartbeats Jump Rope Team in Ohio, Team USA at FISAC Worlds, and USAJR All Stars, earning many gold and silver medals. He has created an amazing organization called One World One Rope, which has brought jump rope to Kenya and Tanzania, providing opportunities for all participants to experience success, develop healthy lifestyles, increase social ties, and take on roles of leadership and responsibility within their communities through the mastery of the sport of jump rope. Mike runs several after-school and summer jump rope programs. His website is www.letsjumpla.com. Jumping rope is used as conditioning for many other sports. Jumping rope burns more calories than jogging.